In the video’s below Bay Area Thrash-Metal legends Vio-lence performed Saturday night and Sunday for the first time since 2003 at the Oakland Metro in Oakland, California. The current band lineup now consists of guitarist Phil Demmel, vocalist Sean Killian, bassist Deen Dell, drummer Perry Strickland, and guitarist Ray Vegas. Former member Robb Flynn of Machine Head was in attendance but didn’t perform. The band has booked has several more shows scheduled for the coming months, including a second Oakland date today (Sunday, April 14); a European appearance at the Alcatraz Hard Rock & Metal Festival in Kortrijk, Belgium; shows with Sacred Reich in Los Angeles and Phoenix; and concerts shows in Brooklyn, New York. Gary Holt of Exodus and Slayer joined the band for a rowdy rendition of the Exodus “A Lesson In Violence”. Eternal Nightmare is held in reverance by thrash metal fans young and old and stands among legendary debuts from fellow first-wave Bay Area thrashers such as EXODUS, FORBIDDEN, TESTAMENT, DEATH ANGEL, etc.. 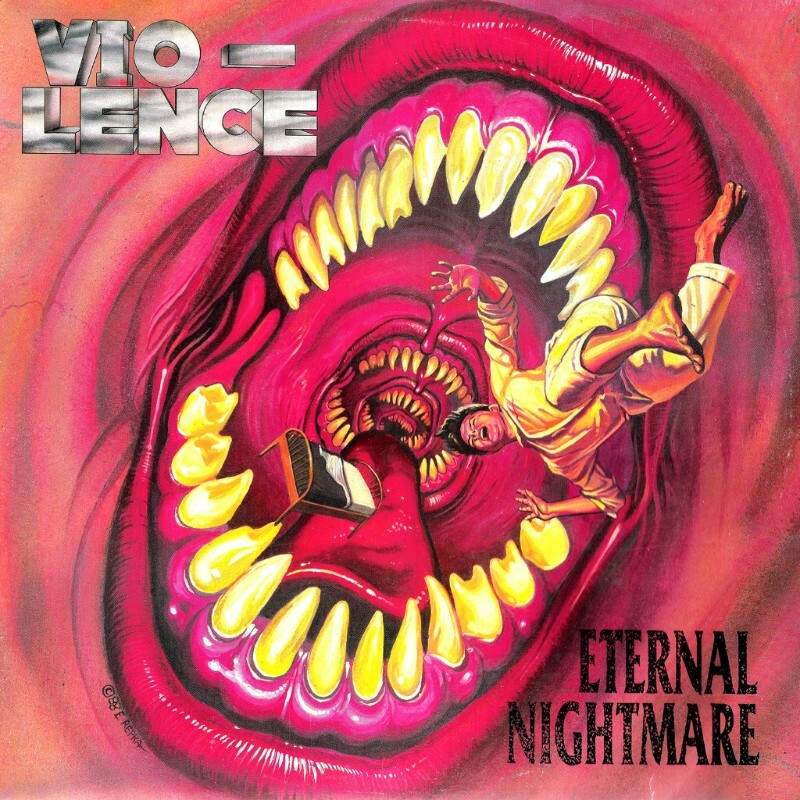 Available on vinyl for the first time since it’s original 1988 release and appearing in its entirety for the first time ever, in any format, the legendary debut album from East Bay thrash metal legends VIO-LENCE has been remastered with five bonus tracks added. Includes the previously unreleased album version of “Torture Tactics” – intended to be the eighth track on the album but omitted from the original release by MCA because of the extreme lyrical theme! Additionally, the band’s legendary four track “Mechanic” Demo is presented in its entirety and for the first time ever on vinyl. • Eternal Nightmare is held in reverance by thrash metal fans young and old and stands among legendary debuts from fellow first-wave Bay Area thrashers such as EXODUS, FORBIDDEN, TESTAMENT, DEATH ANGEL, etc..
• Deluxe package includes a full color gatefold jacket featuring several rare and previously unpublished photos of the band from the Eternal Nightmare era, lyric insert, plus extensive liner notes from guitarist Phil Demmel.